Electrical injuries, although relatively uncommon, are inevitably encountered by most emergency physicians. Adult electrical injuries usually occur in occupational settings, whereas children are primarily injured in the household setting. The spectrum of electrical injury is broad, ranging from minimal injury to severe multiorgan involvement to death. Electrical injuries are shown in the images below. Grounded sites of low-voltage injury on the feet. Electrical burns to the hand. Approximately 1000 deaths per year are due to electrical injuries in the United States, with a mortality rate of 3-5%. Classifications of electrical injuries generally focus on the power source (lightning or electrical), voltage (high or low voltage), and type of current (alternating or direct), each of which is associated with certain injury patterns. This article reviews the pathophysiology, diagnosis, and treatment of electrical injuries caused by manufactured electricity; for further information on lightning injuries, please see Lightning Injuries. Litigation concerning occupational injuries is to be expected, but law suits against practitioners in such cases are rare. Detailed documentation of the presence of electrical burns, including diagrams, can be extremely helpful. Obtain photographic records of injuries, with proper consent, if possible. Electricity is generated by the flow of electrons across a potential gradient from high to low concentration through a conductive material. The voltage (V) represents the magnitude of this potential difference and is usually determined by the electrical source. The type and extent of an electrical injury is determined by voltage, current strength, resistance to flow, the duration of contact with the source, the pathway of flow, and the type of current (ie, direct or alternating). V = I X R; where I = current, V = voltage, R = resistance. The impedance to flow of electrons across a gradient is the resistance (R) and varies depending on the electrolyte and water content of the body tissue through which electricity is being conducted. Blood vessels, muscles, and nerves have high electrolyte and water content, and thus low resistance, and are good conductors of electricity–better than bone, fat, and skin. Heavily calloused areas of skin are excellent resistors, whereas a moderate amount of water or sweat on the skin surface can decrease its resistance significantly. Electrical current can flow in 1 of 2 types of circuits: direct current (DC) or alternating current (AC), in which the flow of electrons changes direction in rhythmic fashion. AC is the most common type of electricity in homes and offices, standardized to a frequency of 60 cycles/sec (Hz). High-voltage DC often causes a large single muscle contraction that throws the victim away from the source, resulting in a brief duration of contact with the source flow. In contrast, AC of the same voltage is considered to be approximately 3 times more dangerous than DC, because the cyclic flow of electrons causes muscle tetany that prolongs victims' exposure to the source. Muscle tetany occurs when fibers are stimulated at 40-110 Hz; the standard 60 Hz of household current is within that range. If the source contact point is the hand, when tetanic muscle contraction occurs the extremity flexors contract, causing the victim to grasp the current and resulting in prolonged contact with the source. Depending on the voltage, current, pathway, duration of contact, and type of circuit, electrical burns can cause a variety of injuries through several different mechanisms. 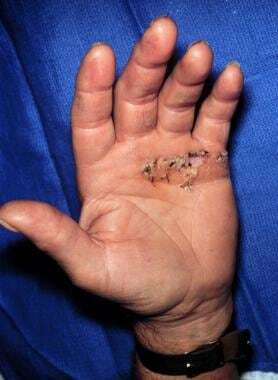 A histologic picture of an electrical burn is shown below. 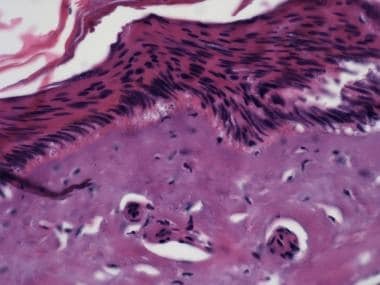 A histologic picture of an electrical burn showing elongated pyknotic keratinocyte nuclei with vertical streaming and homogenization of the dermal collagen (40X). Courtesy of Elizabeth Satter, MD. Current passing directly through the body will heat the tissue causing electrothermal burns, both to the surface of the skin as well as deeper tissues, depending on their resistance. It will typically cause damage at the source contact point and the ground contact point. Contact burns are shown in the image below. Contact electrical burns, 120-V alternating current nominal. The right knee was the energized side, and the left was ground. These are contact burns and are difficult to distinguish from thermal burns. Note entrance and exit are not viable concepts in alternating current. Current sparks are formed between objects of different electric potential that are not in direct contact with each other, most often a highly charged source and a ground. The temperature of an electrical arc can reach 2500-5000o C, resulting in deep thermal burns where it contacts the skin. These are high-voltage injuries that may cause both thermal and flame burns in addition to injury from direct current along the arc pathway. Ignition of clothing causes direct burns from flames. Both electrothermal and arcing currents can ignite clothing. When heat from a nearby electrical arc causes thermal burns but current does not actually enter the body, the result is a flash burn. Flash burns may cover a large surface area of the body but are usually only partial thickness. Electrical injury occurs when a person becomes part of an electrical circuit or is affected by the thermal effects of a nearby electrical arc. Injuries are caused by high-voltage AC, low-voltage AC, or DC. High-voltage injuries most commonly occur from a conductive object touching an overhead high-voltage power line. In the United States, most electric power is distributed and transmitted by bare aluminum or copper conductors, which are insulated by air. If the air is breached by a conductor, (eg, an aluminum pole, antenna, sailboat mast, crane), any person touching the conductor can be injured. Occupational injuries may include direct contact with electrical switching equipment and energized components. Generally, 2 types of low-voltage injury occur: children biting into electrical cords producing lip, face, and tongue injuries, or the adult who becomes grounded while touching an appliance or other object that is energized. The latter type of injury is decreasing with the increasing use of ground fault circuit interrupters (GFCIs) in circuits where people might easily become grounded. GFCIs stop current flow in the event of a leakage current (ground fault) if the ground fault is greater than 0.005 amps (0.6 W at 120V). Electrical injuries are estimated to cause approximately 500-1000 deaths per year in the United States. [3, 4] They are responsible for 3-5% of all burn unit admissions and cause 2-3% of emergency department burn visits in the pediatric population. No racial susceptibility to electrical burns exists. Occupational trends indicate that tradespeople in high-risk occupations are disproportionately white; therefore, this group may be more likely than other races in the United States to experience occupation-related electrical injuries. For those without prolonged unconsciousness or cardiac arrest, the prognosis for recovery is excellent. Burns and traumatic injuries continue to cause the majority of the morbidity and mortality from electrical injuries. Persons who experience low-voltage injuries without immediate cardiac or respiratory arrest have low mortality, but there may be significant morbidity from oral trauma in children who bite electrical cords  or adults who suffer burns to the hand. Persons who experience low-voltage injuries with cardiac or respiratory arrest may recover completely with immediate CPR on scene; however, prolonged CPR and transport time may result in permanent brain damage. For patient education resources, see the patient education article Thermal (Heat or Fire) Burns. Lee RC. Injury by electrical forces: pathophysiology, manifestations, and therapy. Curr Probl Surg. 1997 Sep. 34(9):677-764. [Medline]. Rabban J, Adler J, Rosen C, Blair J, Sheridan R. Electrical injury from subway third rails: serious injury associated with intermediate voltage contact. Burns. 1997 Sep. 23(6):515-8. [Medline]. Spies C, Trohman RG. Narrative review: Electrocution and life-threatening electrical injuries. Ann Intern Med. 2006 Oct 3. 145(7):531-7. [Medline]. Koumbourlis AC. Electrical injuries. Crit Care Med. 2002 Nov. 30(11 Suppl):S424-30. [Medline]. Price T, Cooper MA. Electrical and Lighting Injuries. Marx J, Hockberger R, Walls R. Rosen's Emergency Medicine. 5th ed. Mosby; 2002. Vol 3: 2010-2020. Rai J, Jeschke MG, Barrow RE, Herndon DN. Electrical injuries: a 30-year review. J Trauma. 1999 May. 46(5):933-6. [Medline]. Casini V. Worker Deaths by Electrocution: A summary of NIOSH Surveillance and Investigative Findings. Department of Health and Human Services (NIOSH). May 1998. Luz DP, Millan LS, Alessi MS, et al. Electrical burns: a retrospective analysis across a 5-year period. Burns. 2009 Nov. 35(7):1015-9. [Medline]. Ferreiro I, Melendez J, Regalado J, Bejar FJ, Gabilondo FJ. Factors influencing the sequelae of high tension electrical injuries. Burns. 1998 Nov. 24(7):649-53. [Medline]. Kopp J, Loos B, Spilker G, Horch RE. Correlation between serum creatinine kinase levels and extent of muscle damage in electrical burns. Burns. 2004 Nov. 30(7):680-3. [Medline]. Hussmann J, Kucan JO, Russell RC, Bradley T, Zamboni WA. Electrical injuries--morbidity, outcome and treatment rationale. Burns. 1995 Nov. 21(7):530-5. [Medline]. Kym D, Seo DK, Hur GY, Lee JW. Epidemiology of electrical injury: Differences between low- and high-voltage electrical injuries during a 7-year study period in South Korea. Scand J Surg. 2014 May 7. [Medline]. Baker MD, Chiaviello C. Household electrical injuries in children. Epidemiology and identification of avoidable hazards. Am J Dis Child. 1989 Jan. 143(1):59-62. [Medline]. Rabban JT, Blair JA, Rosen CL, Adler JN, Sheridan RL. Mechanisms of pediatric electrical injury. New implications for product safety and injury prevention. Arch Pediatr Adolesc Med. 1997 Jul. 151(7):696-700. [Medline]. Thomas SS. Electrical burns of the mouth: still searching for an answer. Burns. 1996 Mar. 22(2):137-40. [Medline]. Ordog GJ, Wasserberger J, Schlater T, Balasubramanium S. Electronic gun (Taser) injuries. Ann Emerg Med. 1987 Jan. 16(1):73-8. [Medline]. Sloane CM, Chan TC, Levine SD, Dunford JV, Neuman T, Vilke GM. Serum troponin I measurement of subjects exposed to the Taser X-26. J Emerg Med. 2008 Jul. 35(1):29-32. [Medline]. Cevik C, Otahbachi M, Miller E, Bagdure S, Nugent KM. Acute stress cardiomyopathy and deaths associated with electronic weapons. Int J Cardiol. 2009 Mar 6. 132(3):312-7. [Medline]. Bozeman WP, Hauda WE 2nd, Heck JJ, Graham DD Jr, Martin BP, Winslow JE. Safety and injury profile of conducted electrical weapons used by law enforcement officers against criminal suspects. Ann Emerg Med. 2009 Apr. 53(4):480-9. [Medline]. Strote J, Walsh M, Angelidis M, Basta A, Hutson HR. Conducted electrical weapon use by law enforcement: an evaluation of safety and injury. J Trauma. 2010 May. 68(5):1239-46. [Medline]. Robb M, Close B, Furyk J, Aitken P. Review article: Emergency Department implications of the TASER. Emerg Med Australas. 2009 Aug. 21(4):250-8. [Medline]. Kroll MW, Lakkireddy DR, Stone JR, Luceri RM. TASER electronic control devices and cardiac arrests: coincidental or causal?. Circulation. 2014 Jan 7. 129(1):93-100. [Medline]. Zipes DP. TASER electronic control devices can cause cardiac arrest in humans. Circulation. 2014 Jan 7. 129(1):101-11. [Medline]. Jensen PJ, Thomsen PE, Bagger JP, Nørgaard A, Baandrup U. Electrical injury causing ventricular arrhythmias. Br Heart J. 1987 Mar. 57(3):279-83. [Medline]. [Full Text]. Dawes DM, Ho JD, Reardon RF, Miner JR. Echocardiographic evaluation of TASER X26 probe deployment into the chests of human volunteers. Am J Emerg Med. 2010 Jan. 28(1):49-55. [Medline]. Claudet I, Marechal C, Debuisson C, Salanne S. [Risk of arrhythmia and domestic low-voltage electrical injury]. Arch Pediatr. 2010 Apr. 17(4):343-9. [Medline]. Saffle JR, Crandall A, Warden GD. Cataracts: a long-term complication of electrical injury. J Trauma. 1985 Jan. 25(1):17-21. [Medline]. Haberal MA. An eleven-year survey of electrical burn injuries. J Burn Care Rehabil. 1995 Jan-Feb. 16(1):43-8. [Medline]. Rosen CL, Adler JN, Rabban JT, et al. Early predictors of myoglobinuria and acute renal failure following electrical injury. J Emerg Med. 1999 Sep-Oct. 17(5):783-9. [Medline]. Bailey B, Gaudreault P, Thivierge RL. Cardiac monitoring of high-risk patients after an electrical injury: a prospective multicentre study. Emerg Med J. 2007 May. 24(5):348-52. [Medline]. [Full Text]. Dollery W. Towards evidence based emergency medicine: best BETs from the Manchester Royal infirmary. Management of household electrical injury. J Accid Emerg Med. 1998 Jul. 15(4):228. [Medline]. [Full Text]. Chen EH, Sareen A. Do children require ECG evaluation and inpatient telemetry after household electrical exposures?. Ann Emerg Med. 2007 Jan. 49(1):64-7. [Medline]. Bracken TD, Kavet R, Patterson RM, Fordyce TA. An integrated job exposure matrix for electrical exposures of utility workers. J Occup Environ Hyg. 2009 Aug. 6(8):499-509. [Medline]. Brown CV, Rhee P, Chan L, Evans K, Demetriades D, Velmahos GC. Preventing renal failure in patients with rhabdomyolysis: do bicarbonate and mannitol make a difference?. J Trauma. 2004 Jun. 56 (6):1191-6. [Medline]. Nielsen JS, Sally M, Mullins RJ, Slater M, Groat T, Gao X, et al. Bicarbonate and mannitol treatment for traumatic rhabdomyolysis revisited. Am J Surg. 2017 Jan. 213 (1):73-79. [Medline]. Arcing electrical burns through the shoe around the rubber sole. High-voltage (7600 V) alternating current nominal. Note cratering. Contact electrical burn. This was the ground of a 120-V alternating current nominal circuit. Note vesicle with surrounding erythema. Note thermal and contact electrical burns cannot be distinguished easily. Electrical burns to the foot. High-voltage electrical burns to the chest. Superficial electrical burns to the knees (flash/ferning). Energized site of low-voltage electrical burn in a 50-year-old electrician. Grounded sites of high-voltage injury on the chest of a 16-year-old boy who climbed up an electric pole. Energized site of the high-voltage injury depicted in Media File 9 (16-year-old boy who climbed up an electric pole). Entrance site of a low-voltage injury. Grounded sites of a low-voltage injury in a 33-year-old male suicide patient. Grounded site of a low-voltage injury in the same 33-year-old male patient depicted in Media File 12.